Due to the rise of internet use and a move toward globalization, it may be assumed that white millennial college students are more accepting of cultural diversity and are more likely to be advocates for social justice than generations that have come before them. This project shows that while many white students know how to speak the language of "correctness" and to some degree even believe in what they are saying, their limited personal experiences with those who are racially different from themselves often bump against their beliefs about racial acceptance and equality. 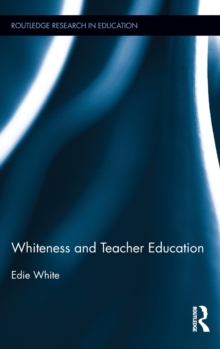 This project investigates the ways that one facet of identity, whiteness, influences teachers' understanding of their roles in the schools and informs their decision making within their practice. It explores several life stories of five teacher candidates, all born after 1985. Through these stories we get a sense of how white prospective teachers imagine themselves as teachers of diverse students and how they imagine developing equitable practices. This work advocates that teacher educators help pre-service teachers unpack and understand their biases in order to facilitate their students in balancing their life experiences with whom they imagine themselves to be as teachers.